All-season Overnight Cruises, Youth Voyages, Family Adventures are all available this year. Both the sheltered waters of the many inlets of the Rakiura National Park and the exposed wilderness at Stewart Island are destination options, depending on you and where you want to go. 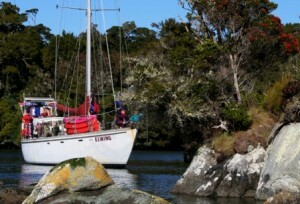 Elwing Discoveries is a Stewart Island locally owned and operated adventure operation on the 14m yacht Elwing. Being aboard Elwing offers individuals and small groups (maximum of 8 people for adult voyages, 10 for youth voyages), the chance to be aboard for Youth Voyages, Overnight Cruises (Paterson Inlet), Multi-night Adventure tours (Stewart Island . If you enjoy day walks, treks, tramping, sailing, kayaking, local history, exploring, and adventure then CONTACT US for dates for the next planned Overnight/Multinight Cruises or find out when you could adventure with us with your own group!. KIDS OVERNIGHT ADVENTURE VOYAGES are also a possibility in the summer months. Children 8 years old and over are welcome to join us on these voyages. We are taking bookings now for all of the above exciting voyages. Check out the dates and see if they work for you. If they do, BOOK NOW – elwingdiscoveries@gmail.com . . if the dates don’t work for you contact us to see if we can make a voyage fit with your plans. NOTE: Payment preferred by Internet Banking – contact us for Elwing Discoveries bank details (Credit Card payment available by arrangement with a 5% surcharge).